Does Orange Dream of Electric Brick? We are enjoying the journey, as it is itself the reward for us. This time, we will focus solely on our beloved “orange” for a briefer time frame compared to that of our prior time frame in the trilogy on the Architect. In this issue, we will glimpse at the novel approaches in the field of digital fabrication, construction and the interaction at the intersection of architecture and robotics to present you a brief background to the creative robotics. Going through an ever-changing landscape of fabrication design, construction industry remains reluctant in comparison to the academia where many applied research projects and experiments are pursued on the issue of construction robotics. Recently, we are very much exposed to robotically fabricated pavilions popping up all around the world, most of which are iterations of the applied research projects started a decade ago. The experiments done in the first phase of these research projects paved the way for digital fabrication applications in the architectural scale. A handful of these experiments are high impact transformations to the way we design and conduct architectural production. Yet, it is a great mystery when the industry will actually be willing to adopt the new paradigm and upgrade the job description of the poor robotic arm that currently only mills out the linear drain board from a marble countertop. Without a doubt, there is a reticence to take risks in the construction industry, and a great hesitation to shift ground even when presented with the exciting possibilities that are manifest through successful built examples. Case studies do not turn into common applications. Maybe we should revisit this phenomena in the future, but it is not our focus for this issue. A still frame from Bot&Dolly’s “The Box”. We have to mention the research institutions and the events that foster the interdisciplinary team of designers, artists, engineers and developers which trigger these explorations into the areas of novelty. 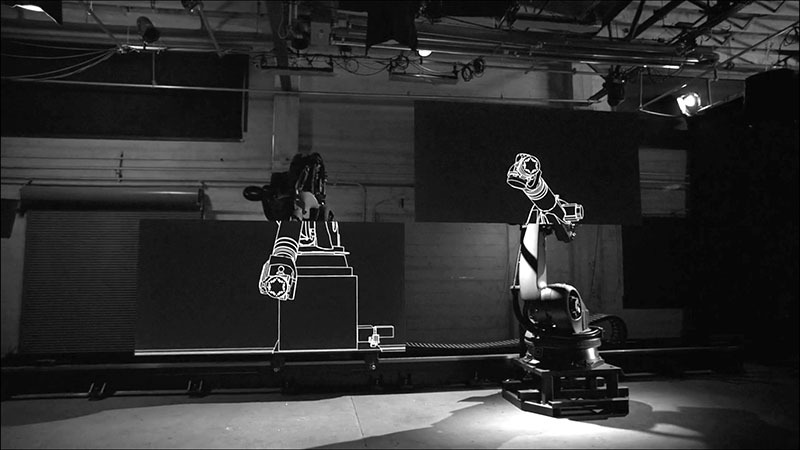 As mentioned in the previous issue, Gramazio & Kohler’s elective course in 2006 at ETH Zurich was the first to utilize an industrial robotic arm in the realm of architecture production through the Programmed Wall and the Oblique Hole projects. The outcomes of these projects have shown that unlike a mason, the robotic arm has the ability to position each individual brick at unorthodox angles without further help from an external reference or tool. Indeed, it is inherit for the robot to lay down bricks at any given position at the same speed it would lay down bricks for a regular vertical wall. In order to assemble a structure rather unconventional, it would exert the same amount of effort to position each brick compared to laying bricks simply on top of another. If so, then why constrain the design to the conventional methods? R-O-B vs SAM: the battle of the innovative and the mediocre. Applications in the following years mostly focused on the manufacturing techniques towards the realization of building elements. First examples utilized the end effectors2 that were directly borrowed from existing applications such as spindle mills, hotwire cutters and grippers. The outcome was profoundly novel for the architect, but not so much for engineers that had been working on similar applications. Yet, it was the way how the architects integrated the robot into their design flow that was quite radical. Association for Robots in Architecture, an open platform for the creative use of robots in fabrication, was founded in 2010 headed by a team from Vienna University of Technology together with leading research groups and universities across the world. For nearly half a decade, the industrial robots were programmed via teach pendants or industry specific programs. In 2011, Association for Robots in Architecture presented KUKA|PRC, a plugin for Rhinoceros’s Grasshopper that enables robotic control within a parametric architectural model; contributing towards an easier access for the utilization of robots by a larger demographic. From this point on, things accelerated exponentially. 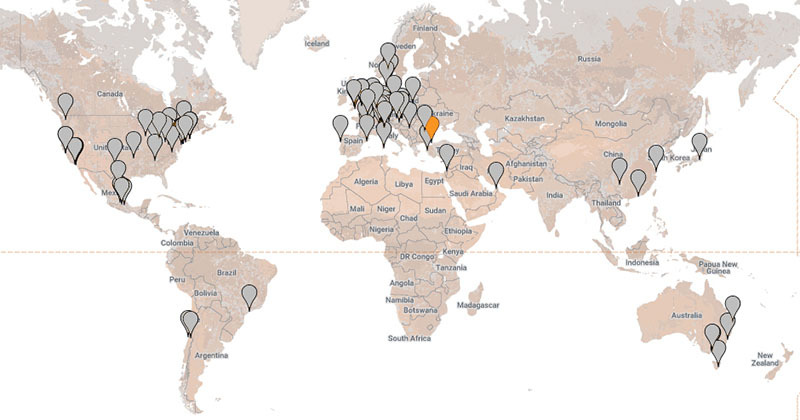 Map of robots in creative industries registered in Association for Robots in Architecture. Our orange on the map and its cousins. First RobArch – Robotic Fabrication in Architecture, Art and Design conference held place in Vienna in 2012 which hosted the pioneers of the community giving priority to making/doing. Experimentation in digital forms of making grew in scope, but material making was the main focus of research. In parallel, digital fabrication technologies revolved around robotic fabrication exploded in other prominent conference series as well. There was a sudden boom of robots in the creative industries including architecture. Robots were (and still are) the new chic. For some, they just had to jump in on the hype wagon. It did not matter if you are really doing something with it – yes, you might have been using that 3D printer for wrong purposes all along or that you might have a CNC which you mill out stuff that could have been cut with a table saw under two minutes – it is still a fancy addition to the “model making” facilities you have, sure to impress the prospective students. Something goes wrong? Just blame the robot. It is the source of Singularity3 and all things evil as portrayed by Hollywood after all. The rest was busy transforming the tools and the design approach. An embroidery frame inspired the design of an end effector to wind carbon fiber threads to create lightweight components as seen in the works of Achim Menges and ICD4, surpassing the use of grippers for complex tasks. Spindles and hotwire cutters were not simply cutting away beautiful geometries, but were also embedding connection details. Of course attaching a nozzle to a robotic arm so that it could print larger envelopes is an important asset, but it really should not be the main focus. Developing spatial 3D printing as seen in the examples of 2015 Tongji Digital Future Workshop or Mataerial5 are far more exciting examples than attaching a nozzle or even a welder to deposit material in one direction, creating a glorified large size 3D printer. 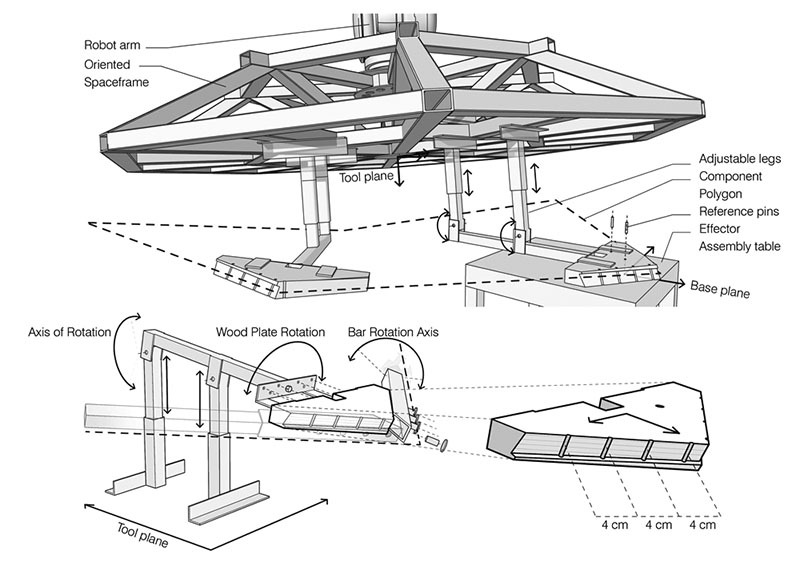 Close-up diagram of the end effector to wind carbon fiber string. Courtesy of ICD Stuttgart. Subtractive, additive and transformative manufacturing processes began to be reinterpreted by the architects. Alberti’s haunting voice was heard loud and clear, architect should design for any building material using any technical device – even take sensory input and create a real-time interaction and cooperation. Why not couple the input and output data to incorporate material and/or human feedback in the process? This projected trend towards sensor-enabled smart process and robotic interaction from robotic fabrication research can be traced via the paper and video submissions to the conference series of RobArch, Fabricate, Smart Geometry and alike. So far, we can program the robot for certain conditions and we cannot directly transfer the cognitive process of an artisan. For now, we know how to deal with homogenous materials that does not require to perceive the material property and respond accordingly (such as EPS, XPS, etc), but there is still a vast opportunity to research into materials that behave differently under different circumstances (such as wood, stone, etc.). Material study alongside the advances in the production technology plays a key role and its importance will only get more vital. We will continue with the projects that present a paradigm shift for the production of complex geometries in the following issues. We are also looking forward to a future where automated fabrication and assembly is positioned more as the norm rather than the exception within a shifting set of design priorities. From this point on, we will be referring to the tool attached to the robotic arm as an end-effector. Robotic arms can utilize various tools depending on the task at hand as they are flexible platforms. Also called technological singularity, it is the hypothesis that a true Artificial Intelligence will trigger drastic changes to human civilization and will replace Homo Sapiens as the dominant force on Earth, much like the Skynet in the Terminator series. Ironically, Singularity is also an engineering problem in the rotational movements of robot axis in the calculation of Inverse Kinematics – which causes the robot to halt, or act erratically as the “limit goes to infinity”. Mataerial is a joint project between Joris Laarman Lab and IAAC Barcelona. This article has been originally published as part of the column FABBRICATION in XXI magazine, vol.159, May 2017. This article can be accessed here in Turkish.